Author(s): My Youssef Arjouni, Abderrahmane Romane, Department of chemistry, Faculty of Sciences Semlalia – Cadi Ayyad University, P.O. Box: 2390, 40000 Marrakech, Morocco. My A. El Fels, Abdellatif Boukir, Methaq Algabr. 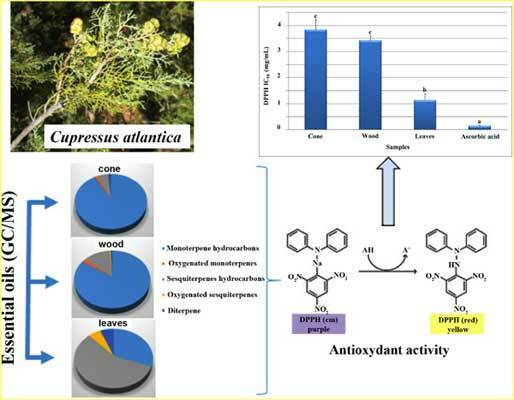 The present study describes the volatile profile and antioxidant activity from leaves, woods and cones of Cupressus atlantica Gaussen (Cupressaceae). The hydrodistillated essential oils of different part were analyzed by GC and GC/MS. In the leaves essential oil fifty-one constituents were identified representing 98.8 % of the oil. The main components comprising trans Muurola-4(14),5-diene (31.2 %), pinene (18.1 %) and α-phellandrene (6.78 %). Monoterpene hydrocarbons representing 81.09% and 89.01%, respectively in the woods and cones essential oil, the major components are pinene (56.6 % - 54.55 %) and α:pinene (56.6 % - 54.55 %) and pα:hellandrene (7.1 % - 15.7 %). The simples were subjected to screening for their possible antioxidant activities by using 2,2-diphenyl-1- picrylhydrazyl (DPPH) assay. The IC50 values of leave, wood and cone essential oils were found to be (1.13 ± 0.24, 3.42 ± 0.18 and 3.84 ± 0.38) mg/mL, respectively. Keywords: Antioxidant activity, Cupressus atlantica, essential oil. GC/MS. Affiliation:Department of chemistry, Faculty of Sciences Semlalia – Cadi Ayyad University, P.O. Box: 2390, 40000 Marrakech, Morocco. Keywords:Antioxidant activity, Cupressus atlantica, essential oil. GC/MS. Abstract:The present study describes the volatile profile and antioxidant activity from leaves, woods and cones of Cupressus atlantica Gaussen (Cupressaceae). The hydrodistillated essential oils of different part were analyzed by GC and GC/MS. In the leaves essential oil fifty-one constituents were identified representing 98.8 % of the oil. The main components comprising trans Muurola-4(14),5-diene (31.2 %), pinene (18.1 %) and α-phellandrene (6.78 %). Monoterpene hydrocarbons representing 81.09% and 89.01%, respectively in the woods and cones essential oil, the major components are pinene (56.6 % - 54.55 %) and α:pinene (56.6 % - 54.55 %) and pα:hellandrene (7.1 % - 15.7 %). The simples were subjected to screening for their possible antioxidant activities by using 2,2-diphenyl-1- picrylhydrazyl (DPPH) assay. The IC50 values of leave, wood and cone essential oils were found to be (1.13 ± 0.24, 3.42 ± 0.18 and 3.84 ± 0.38) mg/mL, respectively.